From the mid-18th century industrial machines were being developed, changing the way in which goods were manufactured. Factories, built to house the machinery, dominated Britain’s urban areas and were the workplace of many. Here are some facts about the factories of Victorian Britain. Factory towns, such as Manchester, Leeds, Liverpool, Birmingham, Middlesbrough and Bradford (to name just a few), were dirty and overcrowded. Smoke from the chimneys of the factories used to coat the walls of the houses and make the streets grimy. The industrial areas around Wolverhampton became so covered in grime that it became known as the Black Country. However, the industrial machinery and the development of the factory did bring wealth to the country. During the the reign of Queen Victoria, Britain’s exports went up dramatically and many businessmen made a lot of money. One of the most valuable exports was cotton cloth. This was mainly manufactured in Lancashire and in parts of Scotland. It is estimated that the cotton industry alone provided jobs for more than 1 million people in the 1850s. Some of the Victorian factories were incredibly large and employed more than 500 people. Life was very hard for workers in most Victorian factories. The working day lasted for twelve hours or more and Sunday was the only full day off. Some factories did allow the workers to go home early on Saturdays. The machines were very loud and they thundered relentlessly all day long. The workers had to move quickly to keep up with the machinery. Workers could be fined or sacked for falling behind. In cotton mills, dust from the yarn covered the workers and got in their throats. In order to make sure that the cotton was kept strong, factory owners kept their mills warm and damp. This meant that the workers often suffered with lung and chest infections. In 1851, more than 500,000 of Britain’s children were working – and many of these were working in factories. Factory owners often paid children a small fraction of the wages they paid to grown men and women. Children, sometimes as young as six, carried out dangerous tasks, such as clearing blockages on spinning frames in mills. Children in factories were often beaten when they made mistakes or worked too slowly. Many workers were killed or injured by the machines they worked with. The didn’t have any safety features and they were slow to stop if a worker got caught up in them. Many factory workers lived in overcrowded, poor quality housing. Built near to the factories themselves, these houses were dirty and they often didn’t have proper drains or separate areas in which to prepare food. Diseases spread quickly through the populations of Britain’s factory towns. Many children died from measles and typhoid. 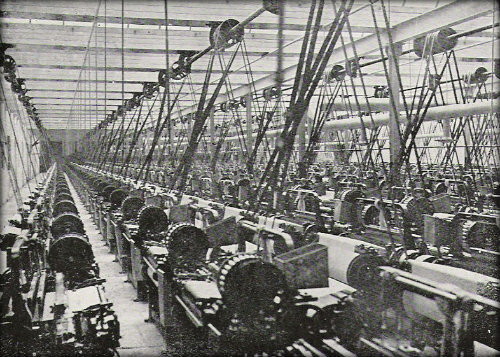 Conditions in factories did improve during the Victorian period. Click here to learn more about the factory reforms (coming soon!). Discover more Victorian facts by taking a look at the Primary Facts Victorian resources page. You really helped me in my lesson so thank you very much!!!!!!!!!!!!!!!!!!!!!! Thank you for this info it really helped my homework! Better marks on my history project.